I've been thinking about rebuilding the carb for a while now, and I'm finally getting around to it. Does anybody have any good suggestions on what brand to kit, or where to purchase a kit? Is there a kit that has everything included, including a new float? I'm new to this, as I've never rebuilt a carb before, but am willing to try it. I still have the feedback carter carb, and even though it always starts instantly, I think it could run a little better, and hopefully get more mpg. Thanks. Rock Auto has kits pretty cheap. I rebuilt mine last month. They don't come with floats, but I believe Rock Auto also sells those separately, though I don't know why you would need to change the float unless it was bad. I'm not getting the float but a few months ago I bought a Walker kit from O'Reilly's and tomorrow morning I'll finally get to use it. I'm rebuilding one of the downdraft CJ-5 carbs and plan on eliminating the stepper motor garbage. I know that means I have a lot of other work to do but I don't care. Anyway it was $11 then. Not sure if it went up since then but these things must be ordered often since I managed to snag the last one in town. I have had great luck with Napa/echlin kits, reasonably priced, but do not come with floats, usually with any kit, you have to order the float separately. I avoid the black foam floats if at all possible. Modern gas eats into them and then sinks them. I was under the impression that if a carb is torn apart to be rebuilt, the float should be replaced. Is this not true? Also, is there anything else that should be replaced, that's not part of the rebuild kit? Depends, if you find a brass float inside, and it's in good condition, meaning no pin holes, there's no reason to replace it (submerse it in fuel, if it doesn't take on any, you're good to go). If you find a plastic or nitrophyl float, it can be tricky to see whether or not it's good, best to replace it just for good measures. Usually, nothing else is needed other than what's in the kit, I'd assume you'd put a new fuel filter on while you're there (kinda goes without mentioning, lol). Thanks for the tips shaggimo. I finally started taking the carb apart yesterday. But I'm having a problem with the fast idle cam retaining screw. The screw is in so tight and will not budge, I've been soaking it with penetrating oil, but it's still in there. I didn't want to force it too hard as I don't want to strip the screw, or break anything. The same thing is happening on my spare carb. Also, I found a youtube video of a BBD being torn down, and that guy struggled with this screw as well. Anybody else have this issue? Any good tricks to get it out without ruining it. Big, sharp (or new) screwdriver will limit the potential for damage (no joke), I have specific screw drivers I use for my carb rebuilds, it does make a difference. It may have lock tite on it too, it's been a while since I've done a bbd, but I think I remember fighting with mine a bit too. Why take it off? You can clean/lube behind it and take the linkage off without removing it. I got it off. 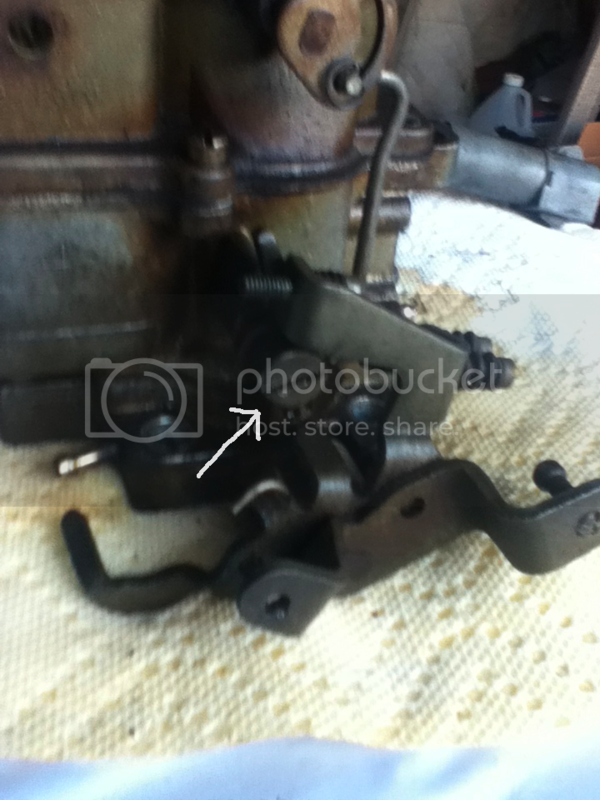 I remounted it to the intake manifold, and then used a pair of channel locks to break the screw loose. Then used my big screwdriver to get it out. Thanks for all the tips. Now I am waiting for the screws that attach the choke to the throttle body to soak, hopefully they come out with ease. Good point, that's was what I thought I was going to have to do. Just following the service manual's instructions for disassembly. Alright, I got the carb completely torn down. Gonna start soaking it in the cleaner tomorrow. Before I took out the mixture screws, counted the turns it took to seat them fully. The left one was 5 turns, and the right took just a little of 3 and half turns. Obviously, these cannot be correct, as they should be the same number of turns for each mixture screw. But doesn't it also seem VERY rich. I thought I read somewhere that idle mixture should start out at 2 and half turns out from seated, then fine tuned from there. Is that right? Where's a good starting point? The service manual says to use an expanded scale tach and to adjust the mixture watching the idle rpm drop. Is using a vacuum gauge to get the highest reading just as accurate as the lean best idle method? I'm still using the feedback system, if it matters.